Shishkin's outlook on nature is that of a researcher, a scientist of the epoch of positivism. 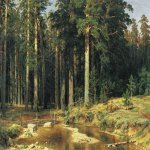 Striving toward authentic re-creation of nature, Shishkin thoroughly researched the object of portrayal, working life for long periods of time. His nature studies resulted in outlines and small sketches that the master used in his work on monumental canvases. 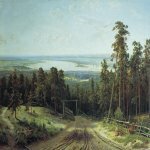 He became the creator of Russian epic landscape painting, and established the genre of forest landscape in Russian art.